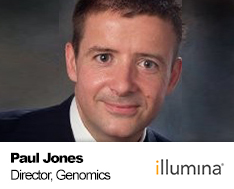 Paul Jones is the EMEA lead for Population Genomics at Illumina, based in the UK. In this role Paul is responsible for nurturing large scale Population Genomics programmes that look to marry translational research with clinical care, often in the context of a national health system. Paul brings three decades of experience in life sciences from a range of different organizations where he has driven innovation at the technology and healthcare interface. His particular interest is in the new business models that are being stimulated by genomics. Paul was the founding CEO of Genomics Enterprises, the commercial arm of Genomics England (GeL), where he led all aspects of the commercial agenda for the 100,000 Genomes Project. As part of this role, he set up and ran the GENE Consortium, involving a dozen companies working together to steer industry engagement with the program. He was also responsible for identifying and enabling other commercial partnerships of relevance to the GeL agenda. Prior to this, Paul led the Global Life Sciences business at Cisco where he advised pharma and biotech companies on the use of technology to drive commercial innovation. He has also held senior positions at IMS Health, Novartis and PwC Consulting.